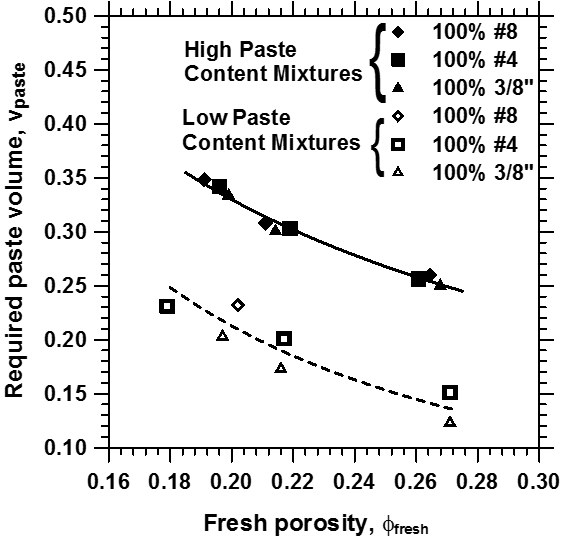 Contrary to the material design of conventional concretes that rely on obtaining minimum porosity and desired compressive strength and workability, the mixture proportioning of pervious concrete strives to achieve a balance between porosity, strength, and paste content (for both workability and strength). Since a non-minimal optimum porosity is desired for the intended material performance, in addition to component volume fractions, the compaction level applied also becomes an important part of the material design process. A rational methodology based on particle packing concepts for the material design of pervious concretes is developed. 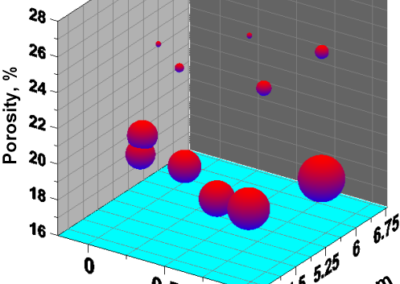 The virtual packing densities of the components of the mixture, the actual packing density of the mixture, and the corresponding volume fractions are used to determine a compaction index. 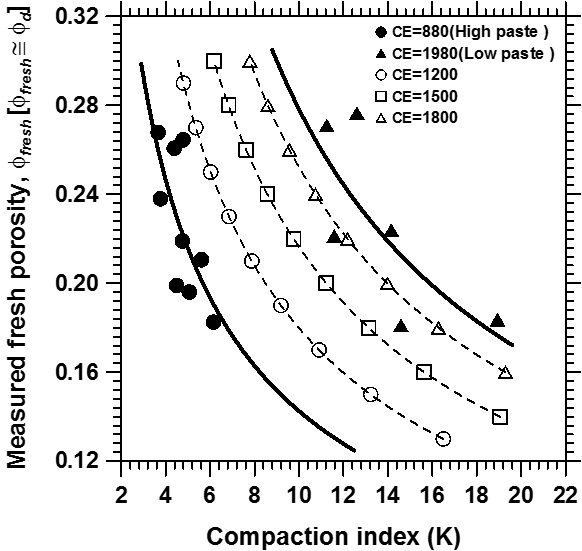 Iso-compaction energy curves and compaction index-porosity relationship for a certain applied compaction energy are shown to be a powerful material design tool for pervious concretes. We have used an analytical form of the Bergman dielectric response of two phase composites to extract the porosity and effective electrical conductivity of pervious concretes from dielectric dispersion measurements. This model assumes small gran contact areas that is valid for pervious concretes. 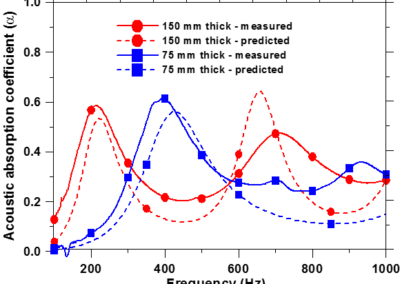 Though the dispersion of both dielectric permittivity as well as electrical conductivity with frequency can be used to determine porosity, we used electrical conductivity spectra because of large enhancement in dielectric constant at low frequencies, and the capability of this model to predict effective conductivity of the material also in addition to porosity. Several characterization tools have been used to characterize the pore structure of this macroporous material. 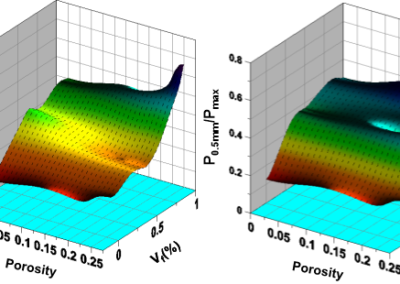 Three different means of characteristic pore size determination – one based on stereology (pore size corresponding to 50% of the cumulative frequency distribution – d50), and two based on morphological operations (dTPC based on a two-point correlation function, and dcrit based on granulometric distribution function) were evaluated for pervious concretes. A two-parameter Weibull distribution was found to adequately model the pore size distribution in pervious concretes. Stereological relations for mean free spacing of pores and the pore distribution density were developed. Transport properties of porous materials such as pervious concretes are inherently dependent on a variety of pore structure features. Empirical equations are typically used to relate the pore structure of a porous material to its permeability. 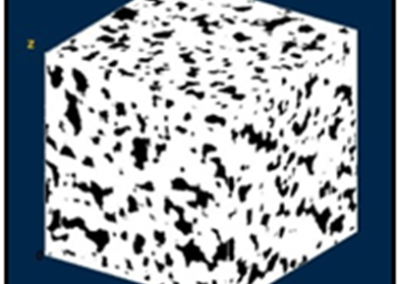 A computational procedure is employed to predict the permeability of different pervious concrete mixtures from three-dimensional material structures reconstructed from starting planar images of the original material. 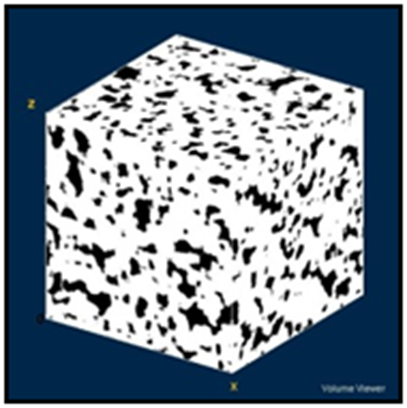 Two-point correlation functions of the two-dimensional images from real pervious concrete specimens are employed along with the measured volumetric porosities in the reconstruction process. 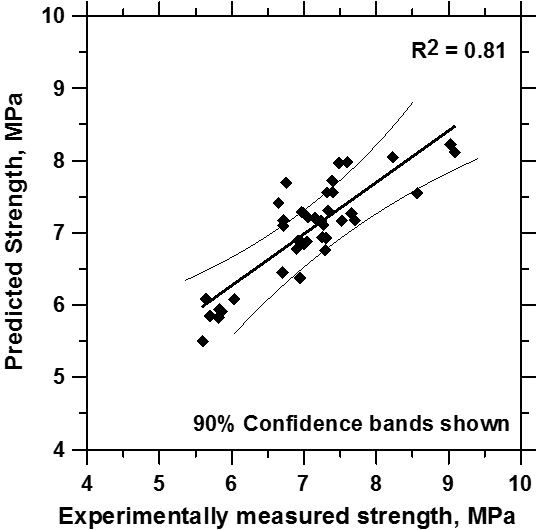 The permeabilities predicted using Darcy’s law applied to the reconstructed microstructures and the experimentally measured permeabilities of pervious concretes are found to be in r good agreement. 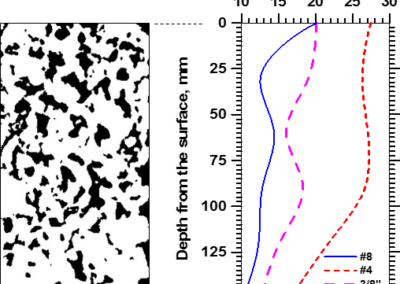 The three-dimensional reconstruction process provides a relatively inexpensive method (in lieu of methods such as X-ray tomography) to explore the nature of the pore space in pervious concretes and predict permeability, thus facilitating its use in understanding the changes in pore structure as a result of changes in mixture proportions. 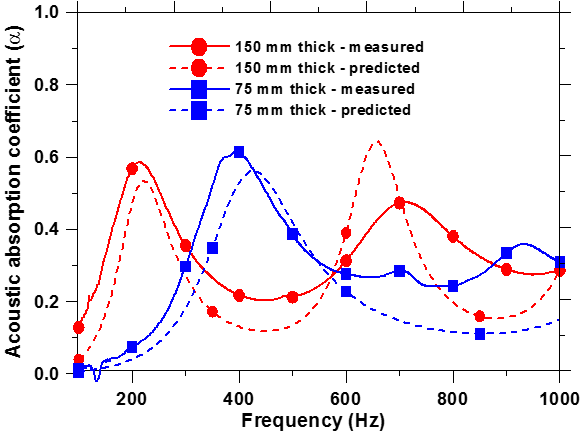 A model to predict the acoustic absorption of pervious concrete is developed. 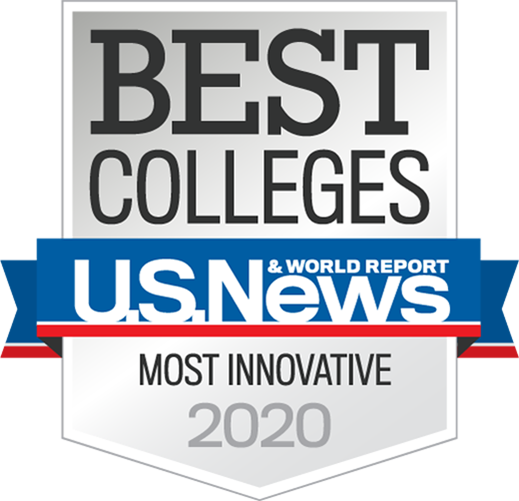 This work considers both a predictive model, and experimental measurements. 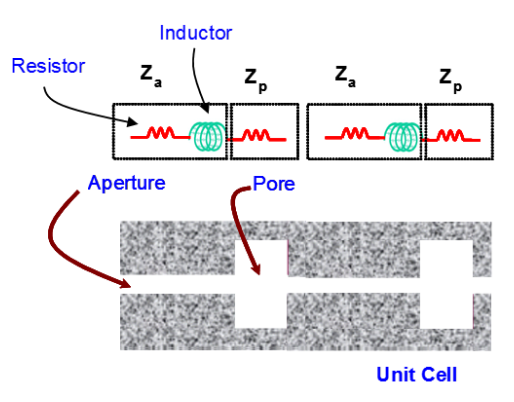 While the acoustic absorption coefficient was determined experimentally using an impedance tube, an electro-acoustic analogy that considered the pore structure as a series of resistors and inductors was implemented to develop the predictive model. 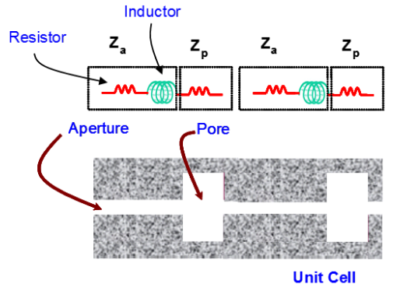 The physical features of the pore network were experimentally characterized using image analysis and pore volume. A parameter termed “structure factor was introduced to account for the increased density of air that is not displaced by the acoustic wave pressure. 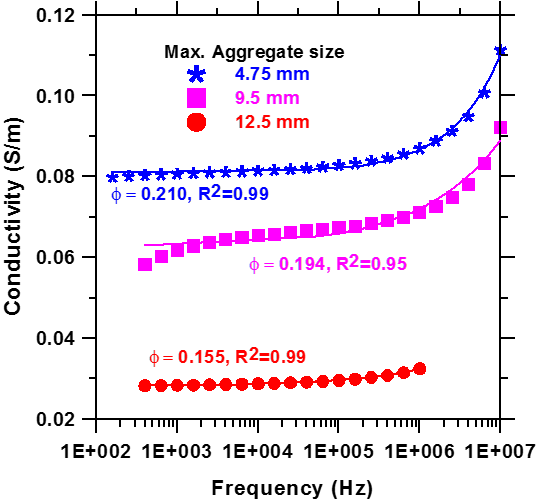 The maximum acoustic absorption coefficient was found to decrease linearly with increasing structure factor. An optimal pore to aperture diameter ratio was observed to exist, that maximizes acoustic absorption. The model and the parametric study are believed to aid in the design of EPC for acoustic absorption by better understanding the type of pore features that should be targeted for best performance. The ability of in-place pervious concretes to effectively drain stormwater runoff gradually reduces as it becomes clogged due to the ingress of fine particles into its pore structure. We studied their propensity to clogging so as to bring out the influence of pore structure features on particle retention and the consequent permeability reduction. Significant permeability reductions are observed when finer sand is used as the clogging material. A certain effective pore size to clogging particle size ratio is found in this study, which is most conducive to particle retention. An idealized 3-D geometry obtained from 2-D planar images of pervious concrete sections is used along with a probablistic particle capture model to predict particle retention associated with clogging material addition and simulated runoff. A “clogging potential” is defined, either as a ratio of the porosity reduction because of clogging to the initial porosity, or as a ratio of the permeability reduction to the permability in the unclogged state. Properties of a random porous material such as pervious concrete are strongly dependent on its pore structure features, porosity being an important one among them. 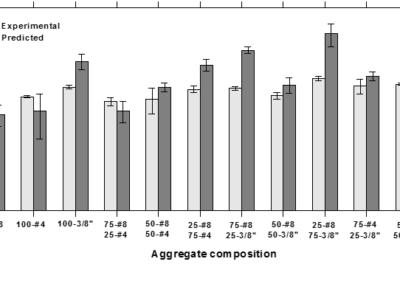 This study develops an understanding of the material structure – compressive response relationships in pervious concretes. The pore structure features such as pore area fractions, pore sizes, mean free spacing of the pores, specific surface area, and the three-dimensional pore distribution density are extracted using image analysis methods. The compressive stress-strain response of pervious concretes, a model to predict the stress-strain response, and its relationship to several of the pore structure features are outlined. 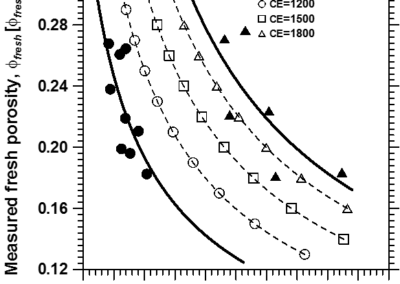 The compressive response is found to be influenced by the pore sizes, their distributions and spacing. A statistical model is used to relate the compressive strength to the relevant pore structure features, which is then used as a base model in a Monte-Carlo simulation to evaluate the sensitivity of the predicted compressive strength to the model terms. 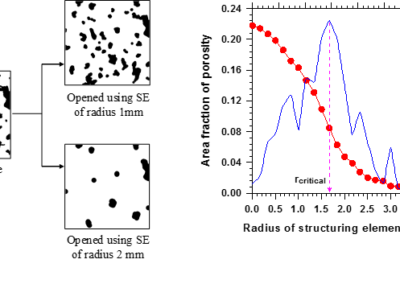 The fracture response of pervious concrete specimens proportioned for different porosities, as a function of the pore structure features and fiber volume fraction, is studied. Stereological and morphological methods are used to extract the relevant pore structure features of pervious concretes from planar images. A two-parameter fracture model is used to obtain the mode I stress intensity factor (fracture toughness) and the critical crack tip opening displacement of notched beams under three-point bending. 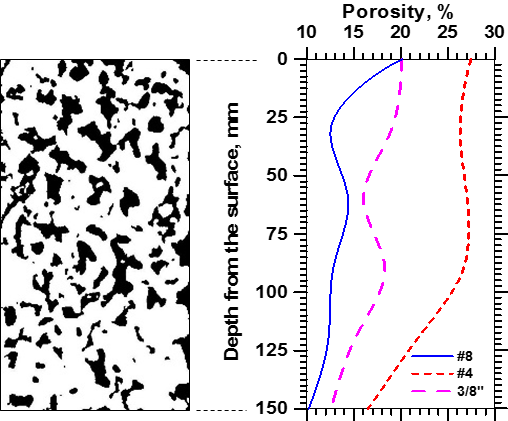 Fracture toughness is primarily dependent on the porosity of pervious concretes. 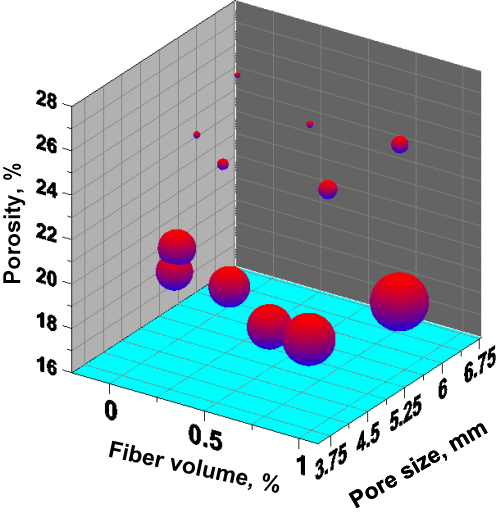 For a similar porosity, an increase in pore size results in a reduction in fracture toughness. 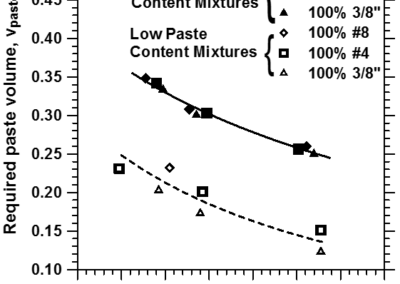 At similar pore sizes, the effect of fibers on the post-peak response is more prominent in mixtures with a higher porosity, as shown by the residual load capacity, stress-crack extension relationships, and resistance curves.